Much like wine, cheese, and coffee, America’s favorite treat has caught on as the small-batch, ethically sourced foodstuff du jour. Some 4,000 years ago, deep in the jungle, ancient civilizations harvested a curious pod worshipped for its spiritual nature. This was cacao, the bean from which chocolate was born. Liquid chocolate, sweetened with sugar, swept from the Spanish courts across Europe when the Conquistadors first returned from plundering the Americas in the 16th century. A couple hundred years later, a Dutch chemist would give rise to mass production with the invention of the cocoa press. Today, chocolate—diluted with sugar, milk, and other ingredients—is consumed by Americans to the tune of 12 pounds per person, per year, a collective craving feeding a $75 billion global industry. The term “fair trade” describes attempts made to regulate commodity industries like coffee and cacao beans. Typical fair-trade standards include minimum purchase prices, regulated child labor, and support for sustainable farming initiatives. But, in many cases, the only actual benefit of fair trade is the falsely appeased consciences of the people who buy these products. “Fair trade is kind of a sham,” Caputo says. To meet fair-trade standards, he says, coffee and cacao bean farmers are forced through a cooperative and pressured to produce more volume, thus using the most resilient strains of beans that, while incredibly productive, are devastating to the world’s ecology. In the end, many fair-trade farmers are actually paid lower wages than those who produce less volume but adhere to better farming practices. Furthermore, chocolate conglomerates take advantage of the fair-trade label by buying fair trade–certified beans and using them as “window dressing”: mixing them with cheaper beans farmed “with really poor karmic use of resources,” Caputo explains. So what’s the socially and environmentally conscious foodie to do? Though really knowing how foods grown in the developing world are farmed is difficult at best, the Domestic Fair Trade Association (dfta.org) evaluates fair-trade and social-justice certification claims on an ongoing basis. Now, however, cacao is getting back to its roots. An appetite for premium, small-batch chocolate has emerged over the past decade, driven in part by a savvier, more educated consumer. Single-origin, boutique chocolatiers are selling craft bars with a cacao content of 70 percent or higher, made from genetically pure beans grown on farms employing ecologically sound agricultural practices. The craft chocolate obsession has boosted the price, yet connoisseurs are eating it up. The bean-to-bar movement—much like artisan cheese, slow food, and third-wave coffee—is the specialty food craze of the hour. Unlike the relatively simple process of roasting coffee, making chocolate involves a series of highly refined steps and, therefore, has an exponentially higher margin of error. As Caputo puts it, “not all beans are created equal.” Genetics and environmental factors predetermine each bean’s distinctive flavor, which the farmer shapes further through fermentation and drying. The chocolatier nuances the bean’s flavor again with roasting. The beans are then cracked, winnowed (husk removed from the cacao nib), ground to a paste, and mixed with other ingredients like sugar. 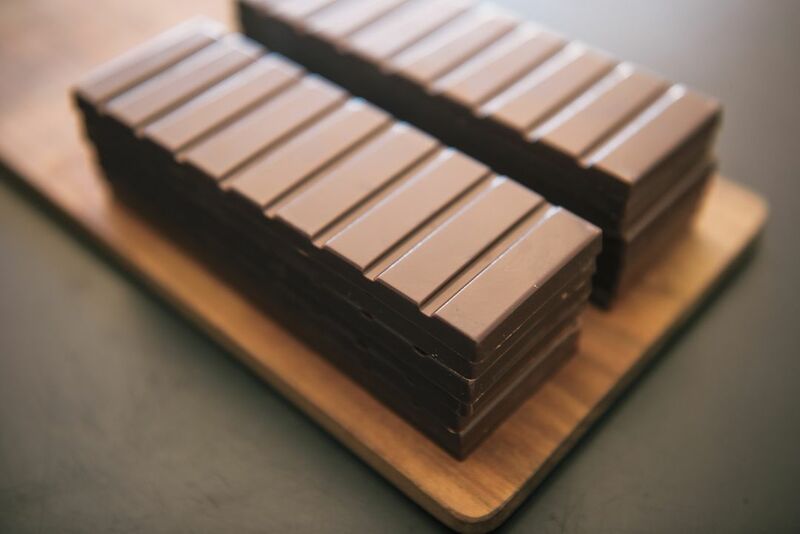 The chocolate is then refined, conched (i.e., machine kneaded, a process strongly affecting both flavor and texture) for one to three days, rendering it finally ready for tempering and molding into bars. Mainstream chocolate producers add not only sugar but also cocoa butter, vanilla, and milk, diluting the cacao content (and masking any mistakes in the process) to as little as 10 percent, the minimum required by the FDA to be labeled chocolate. But purist craft chocolate makers, like Ritual Chocolate (435.200.8475, 1105 Iron Horse Dr, ritualchocolate.com), stick with only two organic ingredients—cacao and cane sugar—allowing the beans to tell their story. Ritual Chocolate co-owners Anna Davies and Robbie Stout first dabbled in chocolate-making in their Boulder, Colorado, apartment back in 2009, when there were fewer than 20 other small-batch makers in the US. They eventually founded Ritual and from the beginning have worked directly with ethical cacao farmers in Costa Rica, Ecuador, Belize, Peru, and Madagascar. And whereas large chocolate conglomerates process upward of 10 tons of cacao beans at a time, Davies and Stout—who still perform much of the production process themselves—work in relatively small 70-pound batches, constantly testing, tasting, and tweaking at every stage to ensure quality is never sacrificed. Preheat oven to 350 degrees. Melt chocolate and butter and set aside. In a separate bowl, use whisk or mixer to beat brown sugar, eggs, and water. Add melted chocolate and butter to the sugar, egg, and water mixture. Stir until fully incorporated, but do not overmix. Add remaining dry ingredients (nibs, banana flour, salt, and baking soda) to brownie batter and stir until fully incorporated, but do not overmix. Lightly grease or line 9" x 13" pan with parchment paper to prevent sticking, and then add brownie batter to pan and distribute evenly. Bake for 18–20 minutes or until firm, or until toothpick comes out clean. TIP: For easy portioning, freeze brownies first and then cut into 4" x 3" grid for 12 brownies.